After securing a ticket for the Copa del Rey semi-finals on Thursday, the non-stop January schedule continues for FC Barcelona on Sunday. It’s an early kick-off (12.00pm CET) at the home of Real Betis, where three points would put the Catalans back on top of the Liga table – at least for the time being. With Andrés Iniesta, Sergio Busquets and Rafinha all forced absentees through injury, Jordi Masip is the only available player that won’t be making the trip. Marc-André ter Stegen is back in the team after being rested for the midweek cup tie against Real Sociedad. The complete squad is thus as follows: Ter Stegen, Cillessen, Piqué, Rakitic, Denis Suárez, Arda Turan, Luis Suárez, Messi, Neymar Jr, Mascherano, Paco Alcácer, Jordi Alba, Digne, Sergi Roberto, André Gomes, Aleix Vidal, Umtiti and Mathieu. Betis have named their two winter signings, Rubén Pardo and Alin Tosca, in their own squad and also welcome back Mandi, who returns following Algeria’s untimely exit from the African Nations Cup. But there are important absentees in Sanabria, Joaquín, Felipe and Brasanac due to injury. Sánchez himself is up for the challenge, and agrees that his side’s defending could be the decisive factor. "They don’t always win” he insists. “Not even with Messi. I hope that we are as good as we can be at the back to stop them from being as good as they are up front. Let’s hope it’s Barcelona who are off balance." 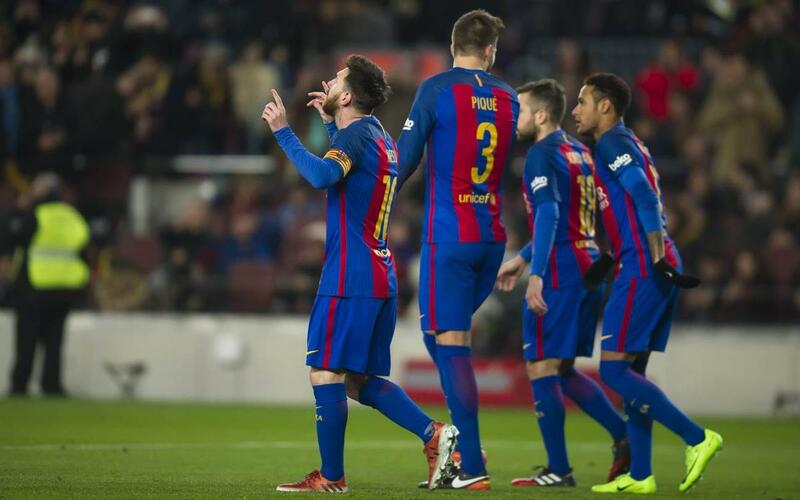 Barça are enjoying the run of wins that they needed after their form dipped after Christmas. That’s five in a row in all competitions but they are still only third in the league. Later in the day, second place Sevilla are at Espanyol and leaders Real Madrid host Real Sociedad. Betis’ form has been somewhat erratic of late but they have collected enough points to be relatively safe in mid-table. No side has managed to win at the Benito Villamarín since Espanyol back in October, and none at all since Sánchez has been the man in charge. Barça have won their last seven games with Betis, including a 6-2 rout on the opening day of this season, Luis Suárez netting three of those goals. The blaugrana did lose a cup game at the Villamarín in 2011, but it hardly mattered after they already led 5-0 from the first leg. In the league, we have to go all the way back to 2008 to find Barça’s last defeat at the hands of the green-and-white half of Seville. No matter where you are in the world we have you covered. You can also listen to live commentary in English on Radio Barça, as well as follow minute-by-minute updates on our official English language Twitter account.